That’s a hard combination of words to say sometimes. No one, it seems, really wants to take responsibility for their actions. I have several friends who work in law enforcement and they tell me the excuses that people will give when they are pulled over for speeding. There’s always a reason why they were breaking the law. Some of the excuses are elaborate and others are just funny! When it comes to excuses, maybe we shouldn’t say that we were just trying out for NASCAR or I was just trying to get to the nearest gas station! It seems that even alone in our car, it’s never really our fault. What if we took responsibility, accepted blame and faced the outcome of the situations we find ourselves in in our lives? 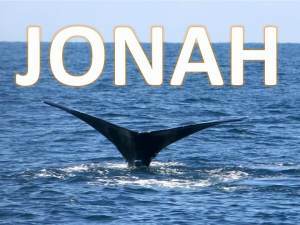 Jonah could blame it on someone else or try to wiggle out of it. Instead though, he takes responsibility for his decision and offers them a way out. Throw me into the sea. It’s my fault! Where in your life do you need to take responsibility, to accept the blame and to place yourself before others? It’s a challenging passage and a challenging thought. Prayer: God, forgive us for the times when we try to pass the blame. Help us, O Lord, to take responsibility for our actions and to repair our relationships with others. Amen.